Hwange is the ideal location to combine a world class safari with a visit to Victoria Falls. Situated in the southwest of Zimbabwe, Hwange National Park is the largest National Park in the country, covering more than 14,600 square kilometres (5,863 square miles) or 1,460,000 hectares. Filled with large concentrations of game, a plethora of birdlife and a diverse variety of habitats. Hwange National Park really is a great game park, for me it is genuine Africa, not filled with tourists in minibuses crowding around a lion kill as one might expect in Chobe National Park or even the Kruger. It's a wilderness with some of the best game viewing you can experience anywhere in Africa yet so few tourists in comparison. Read more on Hwange National Park. The map below gives the appearance that the various lodges are slightly crowded, that's purely due to the scale of the map. The park is very large and the distance between the lodges is great. For an area this size there is a relatively limited amount of accommodation available with many of the camps being high end luxury camps. For details on these camps scroll further down this page. The three main state managed National Park Camps are Main camp, Sinamatella and Robins camp, these all have self catering accommodation and camping facilities. Standards are not great but are adequate (expect some things not to work). At these camps you will also find the parks office where park fees have to be paid. Main camp is the HQ for the whole park and this is where the warden lives. The green area on the map is Hwange National Park but as you can see there are several lodges situated just outside the Park boundary. This is still state land that has been granted as private concessions to lodge owners. Being right on the boundary with the national park it is essentially the same as being in the park and the game wanders freely. Lodges A, B, C, D and E have the easiest access as they are close to the tar road. They do have their own concessions but their main game viewing would be done inside the National Park. 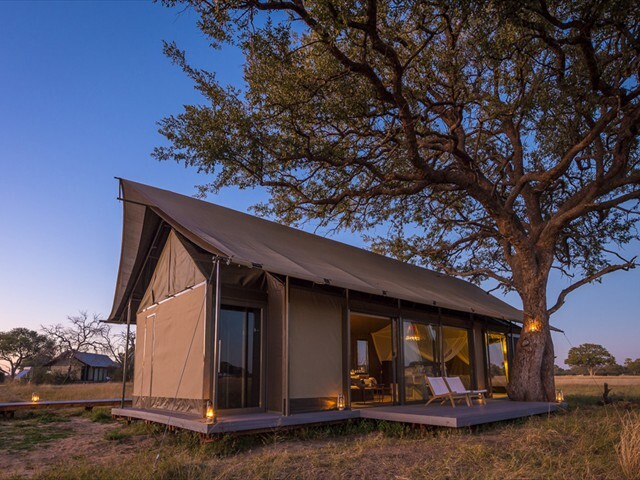 The safari camps F, G, H, I, J, K, L, M, N, O situated inside the park or just on it's boundary, are all luxury safari lodges, it's hard to choose one over another as at all of them you will see great game and enjoy luxury service and accommodation. For further details please contact us so that we can explain the pros and cons of each individual Lodge, their access and prices, which in the end might be the determining factor. If I look at the quality of all the Hwange accommodation, the safari experience that you will get and the prices they charge compared to camps in Botswana or Zambia, I wonder why one would even consider going elsewhere. For details on these camps scroll further down this page. We love Hwange and having spent so much time there feel well qualified enough to give good advice on the various camps, how they differ and what they offer. If you need any help with booking some Hwange accommodation or organising an itinerary please don't hesitate to contact us for assistance - that's what we do! We can package together safaris which include Hwange, Vic Falls, Botswana, Kariba and the lower Zambezi - So just click on the enquiry button below. Listed according to their position on the above map. 1) Standard 2019 International prices - regional and local prices will differ. Access: Road transfer or coach to Hwange Safari Lodge where lodge will collect from. Self drive 2kms from main Bulawayo to Vic Falls road. Air charter to Hwange airport 10kms away. Access: Road transfer or coach to Hwange Safari Lodge where lodge will collect from. Self drive 4x4 only 5kms from Hwange safari Lodge. Air charter to Hwange airport 5kms away. Details: Re-opened in late 2012 Sable Sands caters for people on a lower budget. It is a very good option (in my view the best) for anyone who cannot afford the very expensive luxury lodges. It is not luxury and facilities are limited but it is adequate. Positioned in it's own private concession covering the Dete vlei which is renowned for excellent game viewing, as good as any you will get inside the National park. 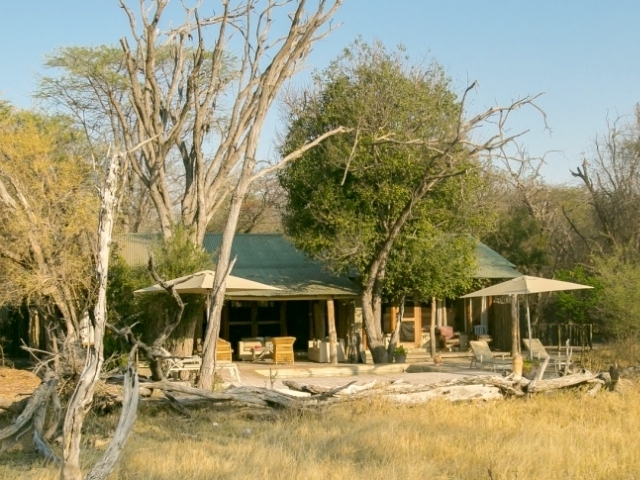 One of the most easily accessible lodges in Hwange. Great self drive option. Access: Road transfers or the luxury coach service stop here. Self drive all tar road. Air charter to Hwange airport minutes away. Details: This is the only large hotel in the area and was once a premier resort. 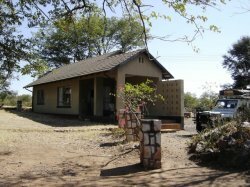 It has The prime location in Hwange just outside the National park on it's own concession which has loads of wildlife. No real need to go into the park, a constant stream of animals pours down to the waterhole in front of the hotel to drink throughout the day, or a short drive on their concession up the Dete vlei will be very rewarding. Sadly now it is run down and needs serious refurbishment. The game vehicles and game guides are no where near up to the standard of the private luxury lodges. It is a cheaper option than a luxury lodge and gets you into the area, but expect to get what you have paid for. 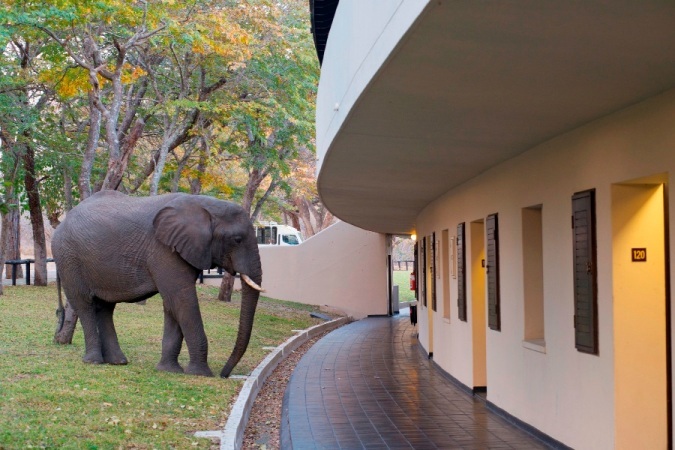 Access: Road transfer or coach to Hwange Safari Lodge where lodge will collect from. Self drive all tar road. Air charter to Hwange airport 10kms. 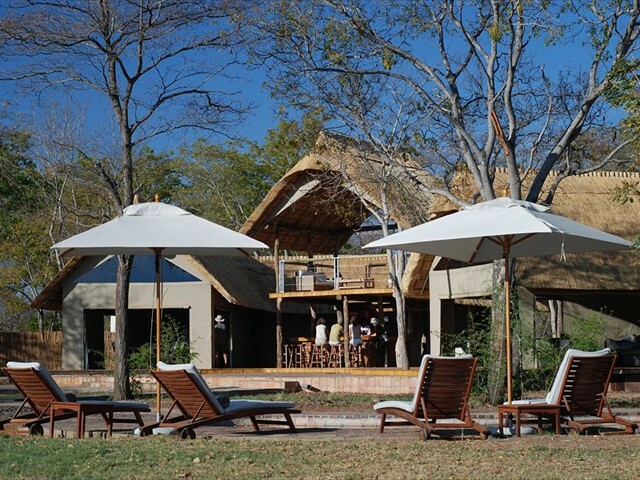 Approximate International Fully Inclusive Rates: Thatched chalet $200 / Thatched treehouse $240 / Tented suite $330 pppns. Details: Being only a couple of kilometres from the town of Dete and on a main road, don't expect this to be a deep bush experience. It is however an ideal location to position yourself for exploring the Hwange National park. A range of accommodation allows for some of the cheapest available in the area. Standards as always are reflected in the price. The concession it is situated on cannot be compared to any of the other accommodation on this page. Approximate International Fully Inclusive Rates: Green Season $350, Mid Season $460, High Season $580 pppns. Details: Elephants Eye is a beautiful, intimate lodge situated in its own 6000 acre private concession just outside the Hwange National Park, only 13km from the park entrance. 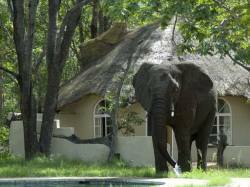 It is one of the easiest lodges to access being located only 175km from the Victoria Falls on good tar road. Location: Large private concession on boundary of Hwange National Park. 32kms from Hwange main camp (dirt road) / 222km from Victoria Falls. Access: Road transfer to Hwange main camp where lodge will collect from at an additional cost. Self drive 4x4 (32kms dirt). Air charter to Hwange airport 45kms. Details: Exclusive Safari Camp, situated right on the boundary of the National Park, in its own private concession. Phenomenal game viewing and outstanding birdlife in a quality camp. A Real Africa Experience!! The camp overlooks it own very busy waterhole, which is floodlit at night. 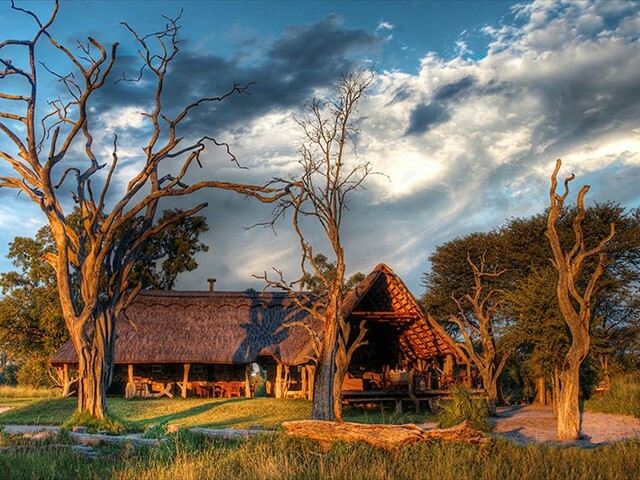 Location: Large private concession with The Hide Safari Camp on boundary of Hwange National Park. 32kms from Hwange main camp (dirt road) / 222km from Victoria Falls. Details: Very reasonably priced Wilderness safaris camp, without the extra bells and whistles that push the price up. Situated on a massive private concession in the southern part of Hwange National park, which is arguably the finest wildlife concession in Hwange if not Zimbabwe. Due to it's remote location, air charter is the best option for access but a long road transfer is also possible. Wilderness are top quality operators so everything from accommodation to food to vehicles and guides is of a high standard. 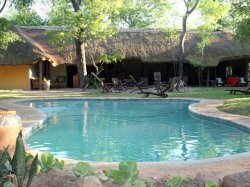 Davison's is situated in a grove of false Mopane trees overlooking a waterhole and an open plain. Same concession as Little Makalolo and Linkwasha but cheaper. Access: Air charter to Wilderness airstrip 15kms. Size: 9 luxury tents - 1 family tent and 8 standard rooms. 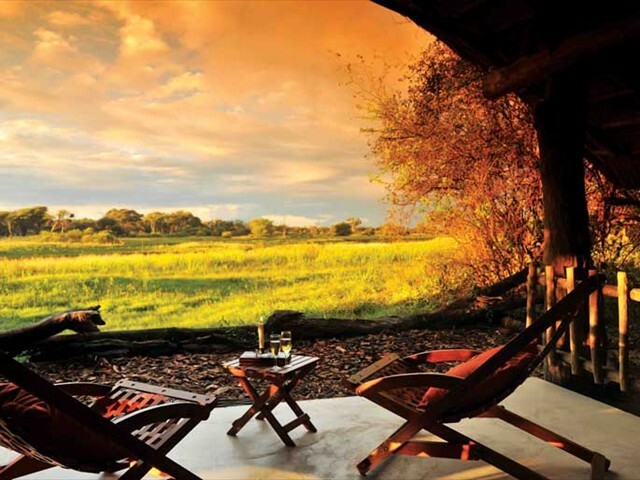 Details: Wilderness safaris has the rights to this private concession in the southern part of Hwange National park. It is one of the best private concessions in Zimbabwe. Due to it's, location air charter is the best option for access. Wilderness are top quality operators so everything from accommodation to food to vehicles and guides is of a very high standard. 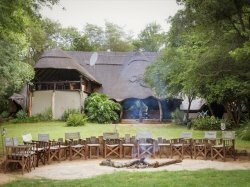 Details: Bomani Tented Lodge is situated on a 5000 acre private wildlife reserve within the Ngamo Forest Area on the remote and unspoilt south eastern boundary of the Hwange National Park. There are no fences simply a railway line that separates the private reserve from the Hwange National Park, therefore game roams freely between the two. Game drives and walks are conducted on both the private reserve and within the National park. We highly recommend Bomani Tented Lodge for a great African Safari, knowledgeable game guides, a wonderful camp location and a bit of community awareness as well. They have sister lodges in Victoria Falls. 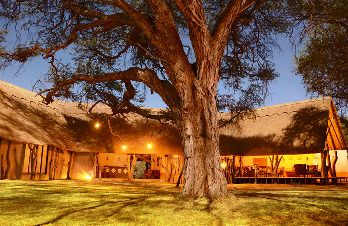 Details: Hidden away in the Acacia Forests bordering the Hwange National Park, this unique lodge has a complete atmosphere of its own. Unlike other 'traditional' Safari camps, Camelthorn Lodge has moved away from the Safari tents and wooden decks that have almost become the norm and brought the feel of a Spanish villa to the African bush. They have sister lodges in Victoria Falls and Hwange. Access: Possible to road transfer but air charter is better. Road transfer to Hwange main camp, Somalisa, will collect from there at an additional cost. Air Charter to Manga airstrip 30mins from camp. Self Drive 4x4 only. 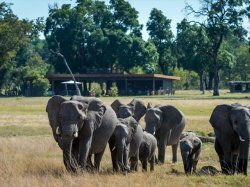 Details: Small exclusive tented safari camp providing an intimate safari experience on it's private concession in the south of the park, which is well know for it's large herds of elephant. Somalisa is set in an Acacia grove over looking very busy waterhole. A unique feature is the swimming pool which has a trough of water which the elephant will come and drink from while you are swimming. Slightly rustic camp but great game viewing and location, Good staff ensure and excellent experience. Access: Road transfer to Mbala boom, Sinamatella or Hwange main camp, Nehimba will collect from there at additional cost. Self drive mostly 2x4. Air Charter to local airstrip 8kms. Details: Situated almost exactly equidistant between Main camp and Sinamatella this camp has access from either side. Nehimba is one of 2 new concessions opened up in the central part of the park, this is close to the dividing line of the Kalahari sands in the south which gives way to open plains and the rocky basalt of the north which leads to more undulating terrain and thicker vegetation. This enables a nice variety of game viewing. This camp receives very good reviews. Location: Private concession within central section of Hwange national park. 43kms from Sinamatella and 81kms from Hwange main camp / 190kms from Victoria Falls. Access: Road transfer to Mbala boom or Sinamatella - Camp Hwange will collect from there at additional cost. Self drive 4x4. Air Charter to local airstrip. 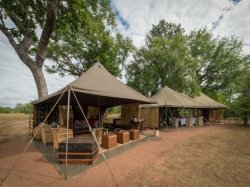 Details: Camp Hwange is one of 2 new concessions opened up in the central part of the park, this is close to the dividing line of the Kalahari sands in the south which gives way to open plains and the rocky basalt of the north which leads to more undulating terrain and thicker vegetation. This enables a nice variety of game viewing. The camps biggest advantage is that of the luxury lodges this has the easiest, quickest and cheapest access to Victoria Falls. Game is very good but probably not as abundant as in the south of the park. The emphasis at this camp is on quality guiding which includes walking. Chalets are situated on an open plain out in the open around a busy waterhole. Location: Remote section in north-western Hwange National Park. 36kms from Sinamatella and 120kms from Hwange main camp / 183kms from Victoria Falls. Access: Road transfer to Mbala gate, Main Camp or Hwange Airport - Hwange Bush Camp will collect from there at additional cost. Self drive. 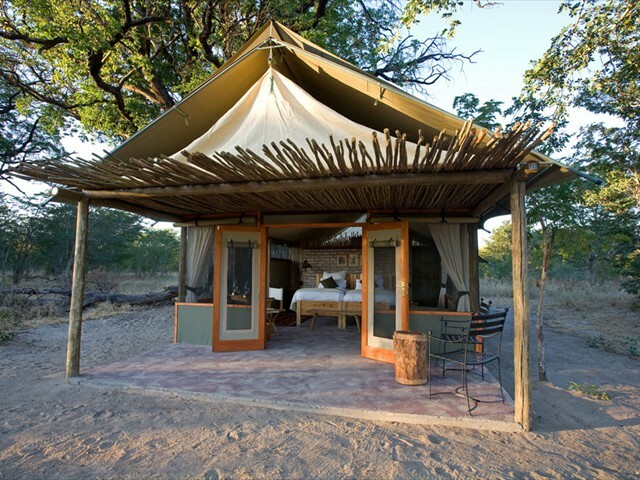 Details: Hwange Bush Camp is an outstanding product that we are delighted to be able to offer. A genuine, authentic safari experience is guaranteed if experienced in the months of late July, August, September and October. The simplicity, yet ample comfort of this bush camp offers guests just the right ambiance and at a price more affordable than some of the luxury lodges. Ideally suited to the more seasoned safari goer but even for first timers who are interested in really getting to know and experience the African bush rather just ticking species off a checklist, the Hwange bush camp will be right for you. 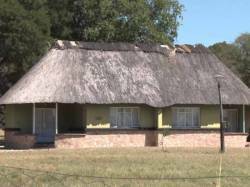 Details: Main camp is the headquarters for Hwange national park. There is loads of reasonably priced self catering accommodation. It is state run and managed so standards are not that high, but adequate I guess for the price. Completely different standard to the privately owned and managed camps. Great place to base yourself and explore the southern section of the park. One needs to be independent when staying here as there are no tour companies to take you on guided safaris in the park. Lovely camp set amongst the Acacia trees. Bookings can only be done through national parks offices. Details: Sinamatella camp is national park camp HQ for the north of the Park. There is several reasonably priced self catering lodges. It is state run and managed so standards are not that high, but adequate I guess for the price. Completely different standard to the privately owned and managed camps. Great place to base yourself and explore the northern section of the park. One needs to be independent when staying here as there are no tour companies to take you on guided safaris in the park. 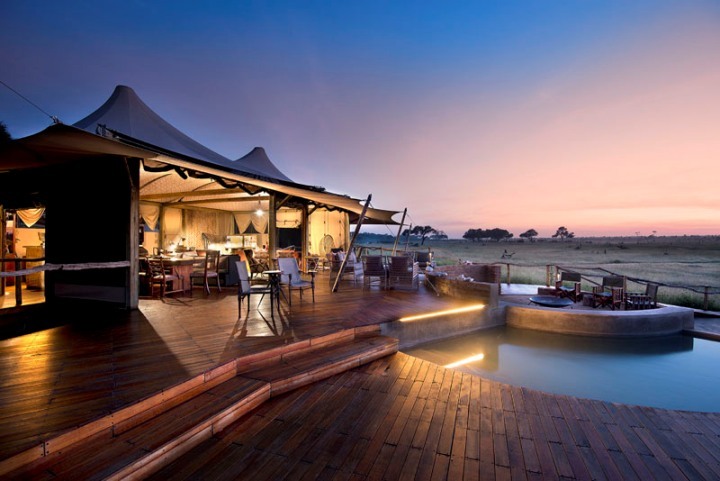 Situated on a high ridge this camp has the most awesome view across the whole of Hwange. Bookings can only be done through national parks offices.